South Elgin, Elgin, St. Charles, and surrounding area's only true local area team. We have nice practice and home game fields in South Elgin (including concessions, fan shop, and scoreboard). 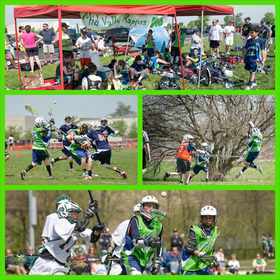 It's time to register for lacrosse. Secure your spot in the 2019 season. All players welcome- new and experienced. Games start mid-April and end approximately mid-June. Everyone is welcome at board meetings! If you are interested in coaching or a position on the board, we encourage you to attend. Refer a friend and receive a $25 gift card (per registered friend) that can be used at our fan shop/concession stand. Returning players do not count as a referal. Bring in a NEW sponsor and receive 1/2 of the donated amount, off your registration. If you'd like to coach, please contact Ed Poelstrel. We now accept credit card and Paypal payments.